Writing and receiving emails has become an inevitable part of everyday life, both in private and business correspondence. When writing an email to your family or friends, you may be as casual as you want. But wait, are you sure you can write a proper business letter to your boss or a client? There are some business email etiquette rules and that everyone is required to follow, even if you are a non-native English speaker. Don’t freak out! In this article you’ll find 10 tips on how to be professional in writing business letters. No doubt, a subject line is the first thing a recipient reads. The decision of whether or not to open an email depends highly on how the subject line looks. Make sure the subject line is simple, specific, but catchy. Use key words that briefly summarize the content of your message. “FYI” in the subject line is a commonly used abbreviation of “for your information“. It is always important to have a contact name, unless a recipient is unknown ( in “to whom it may concern” case). If needed, don’t be shy to call and ask for the person’s name. Some people use informal salutations, such as “Good morning” or “Hi“. It totally depends on how formal your relationships are. If a person has replied to your email, you should thank him/her by writing “Thank you for your (prompt) reply“. It is important to start an email on a positive note, as it creates a good first impression of you. 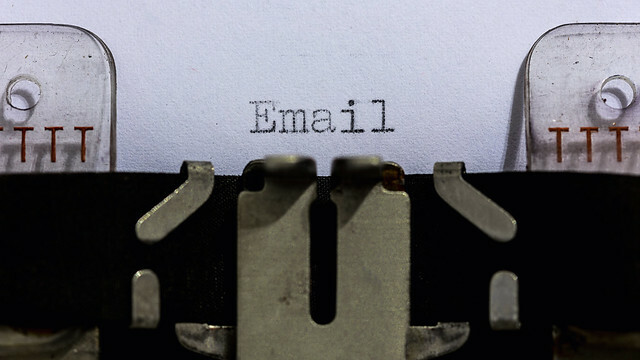 No matter how complex your email appears to be, try to define its purpose clearly at the very beginning of the email by writing “I am contacting you as…” or “I am writing to you in reference to/regarding…”. It helps the reader understand the purpose of your email. Being clear and precise is important, as most business people have no time to read all emails they receive. Being specific about the purpose of your email will save them time and will be much appreciated. According to McKinsey Global Institute’s survey, we spend 13 hours a week or 28 percent of the workweek managing emails. Apparently, this is not a pleasant fact! So, to save everyone’s precious time, keep your emails specific and concise. It is also a good idea to split the body of the email into several paragraphs, based on the topics you raise. You can also use bullet-points, which makes it easy to read. Your manner of speaking depends on who you are talking to. It usually comes naturally and is based on your relationship with an interlocutor. It applies to emails as well. Informal: Sorry, I can’t meet you. I’m busy that day. Formal: I am afraid I will not be available to make it that day. Delivering bad news is never easy! But it’s something you have to do sometimes, when working in a business environment. A good way to do it is to provide a reader with neutral or positive information first. Only then move to the negative part, explaining what caused it and why it’s important. The final part of the message should provide a potential solution to the problem or an optimistic note. It is like making a sandwich! Your goal here is not to hide or minimize the scope of the problem, but to leave the reader with the impression that you care or you are taking action to fix it. Before ending your email, thank the recipient one more time by saying “Thank you for your consideration.” It is also very common to add “should you have any questions, please do not hesitate contact me” or “I look forward to hearing from you“. As you have already constructed your email beautifully, it requires a beautiful closing too. There are many ways to do so, and again, it depends on the formality of relationships between you and the reader. Choose the most suitable phrase before typing your name. Wait! Don’t send it yet! It is very important to reread your email carefully before hitting the send button. Check if there are any typos, grammatical or punctuation errors, or inappropriate word usage. It’s always good to ask someone else to proofread it for you. Remember that you cannot get the email back once you send it! Those are basic tips on writing a business email. Some of you might feel that there are too many rules to follow, but we assure you that you’ll get used to them with practice. So why don’t you try to write a formal email to your teacher or classmates? Happy emailing everyone!